Four-dimensional polytopes are known as polychora. They can't be truly realised in our three-dimensional world of course, but there are a few different ways to visualise them in 3D. Below are a few models I've made based on 3D representations of 4D polytopes. These were all designed and their nets printed using Stella4D. Just as you can look at 3D geometry on your 2D screen, so too you can project 4D geometry into our 3D world. If you look at one side of a cube though, all you can see is the square in front. It's similar when projecting 4D into 3D, where you may only be able to see a single polyhedral cell of the polychoron, which encloses and hides the rest. To make nice models, it helps to hide some of the cells, revealing the structure within. Here are some models made in this way. 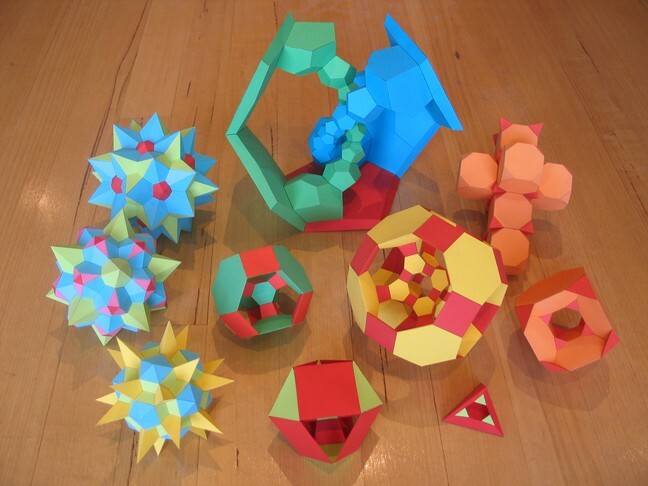 3D polyhedra have 2D nets, so as you may imagine, 4D polytopes have 3D nets. Each side of a polyhedron is a 2D face, whereas each side of a polychoron is a 3D cell. The cells attach to each other face-to-face. It's hard to imagine how the solid net would fold up, but with an extra dimension this becomes possible. If you lived in a 2D world and looked at the unfolded 2D net for a cube, it would be hard to imagine how the squares could possibly fold up. Indeed in that 2D world they would be locked. An extra dimension makes the folding possible. Stella4D can show you the unfolded 3D nets for any of its polychora. Here are some paper models. Slicing through a 3D polyhedron gives you a 2D cross-section. Similarly, slicing through a 4D polytope creates a 3D cross-section. An icosahedron has 6 5-fold symmetry axes, which means that a cross-section taken anywhere along one of those axes will exhibit 5-fold rotational symmetry. A polychoron on the other hand can have up to 60 icosahedral symmetry axes, meaning that a cross-section taken anywhere along one of those axes will yield full icosahedral symmetry. Changing the depth at which the slice is taken will smoothly morph the model into different forms, all the time maintaining icosahedral symmetry. Some of these look magnificent. Paper models are shown below, but you need Stella4D to control the slice depth interactively and watch these beauties animate!